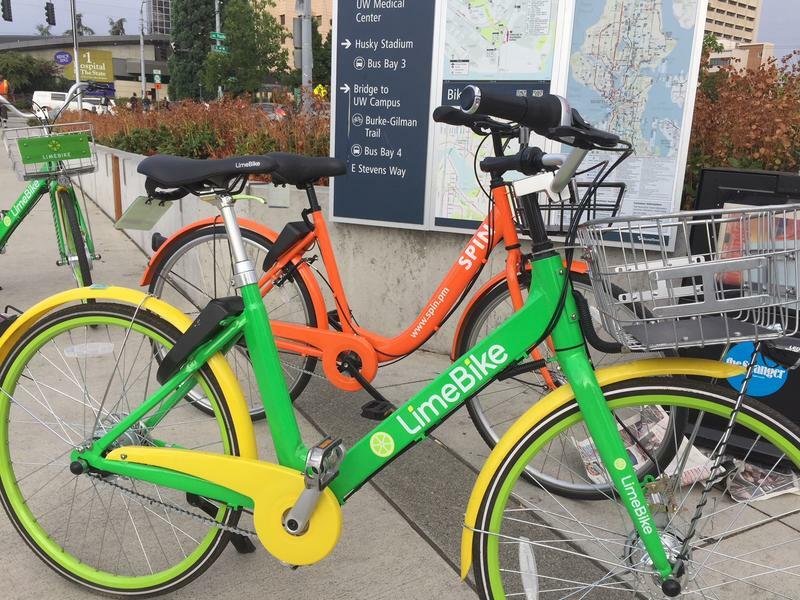 Seattle recently replaced its docked bike share systems with several dockless options. One of the dockless companies, LimeBike (bike pictured in front), applied to offer bike share services in St. Louis. In some parts of the country, such as the Minneapolis-St. Paul region and New York City, riders can pick up bikes from racks throughout their community. Dockless bike shares are less common, but have gained popularity in the past two years. The systems let riders leave the bikes anywhere that’s safe instead of requiring them to return to a dock. “This is a no-cost program to the city,” said Deanna Venker, commissioner of traffic for St. Louis. A docking system could have cost the city more than $5 million a year, Venker said. With the dockless model, companies instead pay the city $500 a year for a permit and $10 per bike per year to maintain services. Typically, bike share users must first download a smartphone app that is connected to a credit card. To gain a permit in St. Louis, companies must provide smartphone- and credit card-free options. Some companies allow riders to pay in cash or use a prepaid card, then unlock the bike by phone call instead of app. One of the companies is ofo, a Beijing-based bicycle share company that popularized the dockless concept. Bikes from ofo cost $1 per hour to ride. Permit documents and the bike share website note that low-income and student riders may receive discounts. Venker said that bike share companies will be responsible for proposing and developing any discount programs. In other U.S. cities, ofo has worked with local colleges and community outreach programs to subsidize rides. A spokesman for the company said recently that St. Louisans could expect to see similar programs here if the company’s permit is approved. California-based LimeBike, the other company, also offers discounts for students and low-income riders. Its bikes cost users $1 per 30 minutes to ride, according to the company's website. The city also will require companies to place bikes in places people may have to walk instead of take public transit. 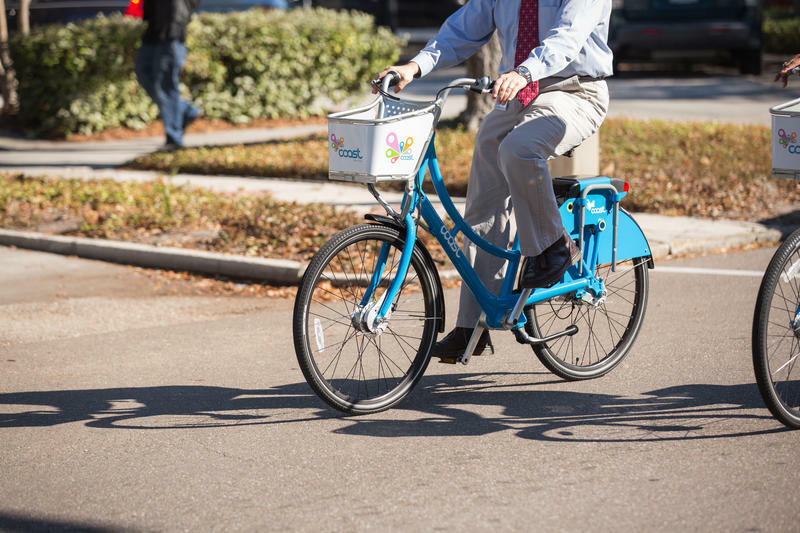 The city has developed its “equity map” to find areas where residents “faced disadvantages” that bike share could help solve, according to permit documents. Each company must keep 20 percent of its bikes in these areas, which a study based on U.S. Census data identified as most of St. Louis north of Delmar Boulevard, as well as some of south St. Louis, centered on the Dutchtown neighborhood. “We wanted to hit the neighborhoods where we had people of color, we wanted to reach the areas where we had no automobiles available in households, where we had some non-English speaking users,” Venker said. One person who relies on public transportation said that using a bike for part of his daily trips would make his commute faster. “I would use it,” said Kwamaine, who didn’t want to give his last name. He spoke to a reporter while waiting for the bus at Grand Transit Center on South Grand Boulevard. Kwamaine lives near Fairground Park in one of the north St. Louis neighborhoods the city includes in its equity initiative. “I think that people need to be more active,” he said. “This could help.” He’d like to take his girlfriend and their five children on family bike trips in downtown St. Louis. Bike share could provide an affordable way to do that, as long as the bikes are the right size for all his kids — which isn’t a guarantee. Bikes can help overcome limitations of public transit, said St. Louis BWorks executive director Patrick van der Tuin, whose volunteers teach kids bicycle safety and help them earn their own bike. “St. Louis has some issues with public transportation. That’s from routes, to timing, to you name it. A bicycle can be a great, low-cost alternative,” he said. He likes to use his own commute as an example. Van der Tuin lives in the Hill and works in Soulard — about a 5-mile trip. It takes an hour and 30 minutes to an hour and 45 minutes to commute by bus, after walking to the bus, transferring to another line, and walking to work. But the bike ride takes 20 or 25 minutes, most days. But he’s concerned that to cover the “last mile” Venker describes, St. Louis would have to “saturate” neighborhoods with bikes — which it might not be able to do right away. “They can ride from x, y and z to the grocery store to pick up the groceries, but there’s potential that when they walk out of the grocery store that the bike might not be there anymore,” van der Tuin said. 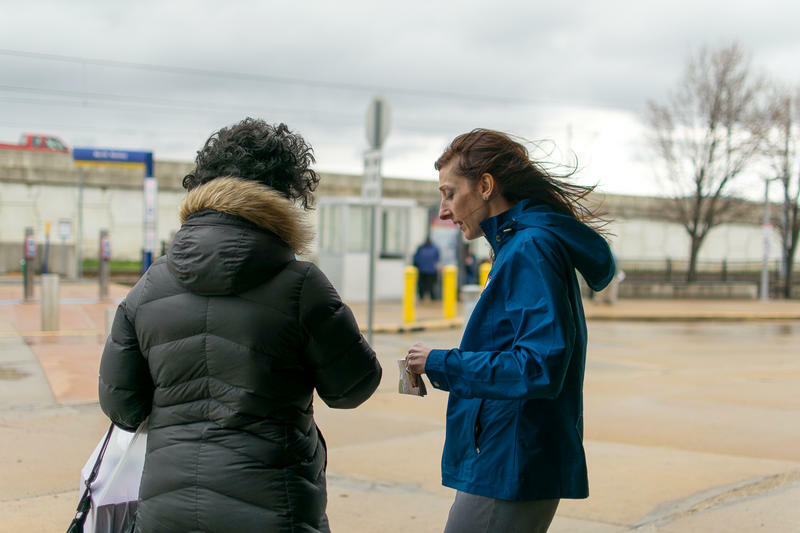 At Grand Transit Center in late March, public transit riders didn’t know a bike share was coming. But several riders said that they think they’d use the bike share — as long as it were cheap. “I love riding bikes,” said Brian Willis, who walks every day as part of his commute from University City to Grand Center, where he works at Chipotle. Willis owns a bike, but he can’t always bring it with him. So he’d like to rent a bike to cover some ground he’d normally walk. Aubra Ladd (left) said that as a student, bike shares seem like a cheaper alternative to traveling by Uber. Her mother, Gwenae Ladd, said she'd ride the bikes while visiting her daughter. 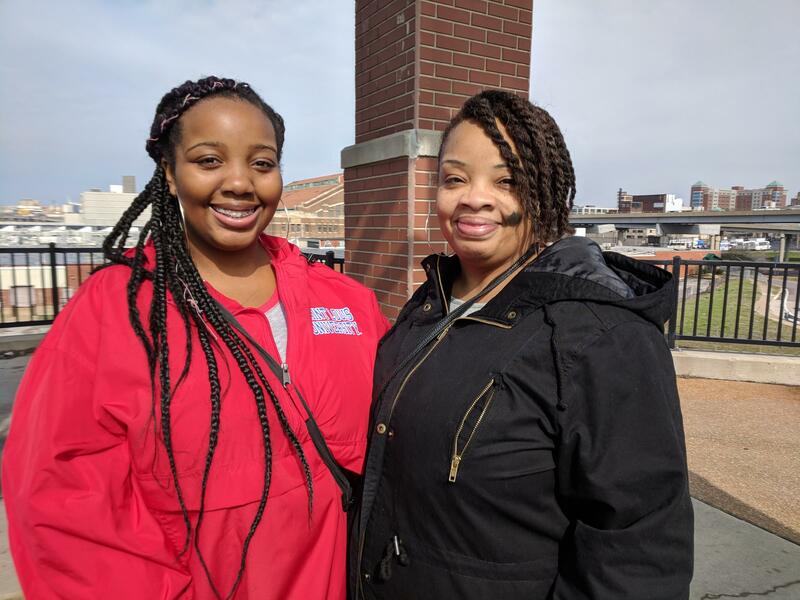 Another potential user is Aubra Ladd, a freshman at Saint Louis University, has found that sometimes Uber cost more than she wants to pay. She said she’d use bike share as a cheaper option “just to get around” when she’s using public transport or walking. Van der Tuin, of BWorks, said that he’s excited to see a program that encourages more people to bike. With more riders, though, he said the city may have to work hard to prevent safety problems and enforce road laws. Most bike share companies ask riders to follow local road laws and don’t provide helmets, so it’s often up to riders to stay safe. Inform our coverage: This report contains information gathered with the help of our Public Insight Network. Please click here, to see responses from others who shared their insight into bike-share programs. To learn more about the network and how you can become a source, please click here. St. Louis officials are shifting gears to bring a bike share program to city residents and visitors. The St. Louis Board of Alderman Friday approved the permit application to run what’s known as a “dockless” bike share program. Alderman Scott Ogilvie, D-24th Ward, the bill’s sponsor, is hopeful a company will be up and pedaling later this year.